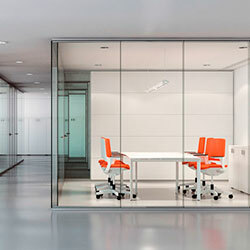 These are some of the primary characteristics of the Flot system, which allows complete acoustic solution without hindering transparency and openness, uniquely designed for corporate fitouts. Based on a profound study of structural design, acoustic results and demountable engineering. Flot was born on a set of profiles that allows a seamless glass Façade transparency with clean visuals. The Flot solid wall, provides a clean and comprehensive integration of glazed to solid wall, with an uninterrupted interface of materials using the same Flot profiles for multiple materiel applications. Flot is available in double and single glazed, panels and doors. Our customer service team is available from 8:00 - 17:00 Monday to Friday. Copyright © 2019 OZ Global. All rights reserved.